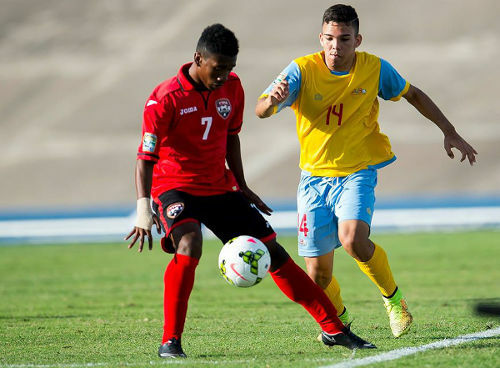 The Trinidad and Tobago National Under-20 football team must find a pathway through Panama tomorrow to get to the New Zealand 2015 FIFA Under-20 World Cup. 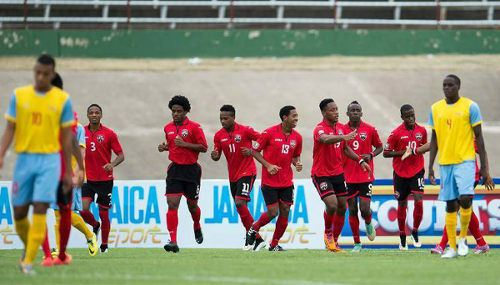 The young “Soca Warriors” face Panama at 3 pm (4 pm TT) tomorrow at the Catherine Hall Stadium, Montego Bay in the first of three intriguing CONCACAF Under-20 Championship Group A matches. A 2-2 opening draw against Jamaica and 2-0 loss to Guatemala, on either side of a 5-1 rout of Aruba, have left Trinidad and Tobago needing a result against the group’s best team and CONCACAF’s rising force, Panama, to have any real chance of progress. 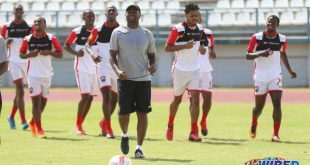 Trinidad and Tobago head coach Derek King concedes that it is a tall order but he believes his charges can pull it off. For the first time though, the Warriors, who dominated possession in all three group matches so far, expect to be forced to play off the back foot. 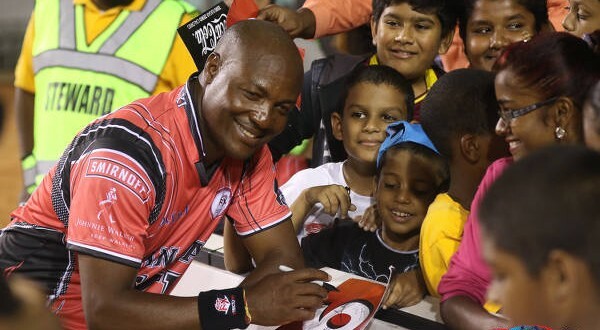 “We taking a very cautious approach because Panama is a solid team and one of the better teams we will be playing against,” King told Wired868. 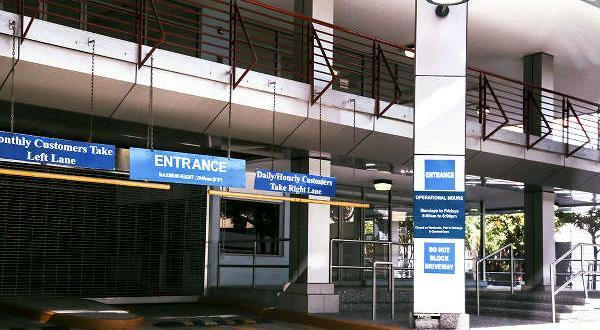 “They are well organised and very athletic but they are beatable. So we are going out there to keep our shape and discipline and more or less play on the counter. The chances we get we will have to put them away. Only the Aruba contingent is eliminated at this point. Should host nation Jamaica defeat the United States at 8 pm local time tomorrow, the “Reggae Boyz” can get to seven points and maybe into the next stage once they defeat Aruba, their final group opponent, by four clear goals on Wednesday. Team Guatemala is expected to beat Aruba tomorrow, which would take the Central American team to 10 points. The two face off at 5.30 pm local time. It means anything less than a win for Panama against T&T will force the Group A favourites into a must win situation in their final group match against Guatemala if they are to qualify directly for the Under-20 World Cup. Only the group winners are assured of a spot in the New Zealand tournament. The second and third place teams from either group must enter a four-team play off to fight for the two remaining qualifying spots. And that brings us to the United States and Trinidad and Tobago. 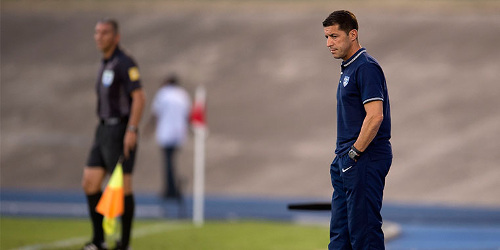 Photo: United States National Under-20 Team coach Tab Ramos. The United States is favoured to defeat Jamaica tomorrow, which would take the “Yankees” to seven points and three clear of the Warriors. USA and T&T face off on Wednesday evening from 5.30 pm (6.30 pm TT time) in Montego Bay. A draw between Jamaica and USA tomorrow would still leave T&T needing a win in its final group match on Wednesday. But it is the only result that could keep the Warriors alive whether they get a point against Panama or not. Okay, calculators down. Now, it is time for the young Warriors to do something really special. King might be without playmaker Duane Muckette and midfield hustler Kevon Goddard who are both injury concerns today. Muckette has a sore hamstring while Goddard took a knock on his ankle. King, who has already used 17 of his 20-man squad in Jamaica, was tight-lipped about any possible changes for tomorrow’s crucial clash. However, there was a suggestion at the team’s session that former St Augustine Secondary standout Ricardo John, who now represents Virginia Tech in the United States, could play a vital role. 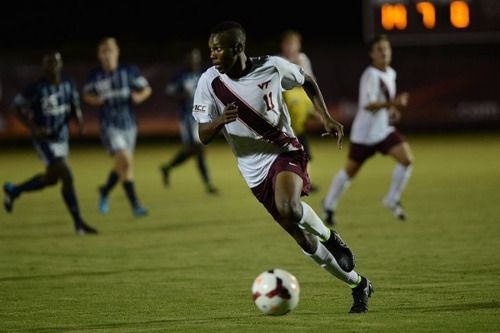 Photo: Virginia Tech striker Ricardo John is a former St Augustine Secondary standout and SSFL Player of the Year. He might be called upon to help rescue Trinidad and Tobago’s faltering Under-20 World Cup qualifying campaign. The tall, quick striker featured off the bench in Trinidad and Tobago’s opening draw against Jamaica and his 20-minute cameo then represents the sum total of his international experience. This statistic owes much to the fact that the Warriors were unable to get a single international practice game before the CONCACAF tournament. But John might have a big job to do tomorrow between Panama’s two fast, muscular central defenders. Kadeem Corbin, who started all three CONCACAF games upfront, might move to the “number ten” role which has not been convincingly filled thus far in the competition. Muckette showed good skill and vision as playmaker but lacked the legs to get close to his striker while Jabari Mitchell, the 2014 SSFL Player of the Year, has not been at his sharpest and St Anthony’s College playmaker Matthew Woo Ling only featured once as a second half substitute against Aruba. Rather than stick to a script that has not worked so far, King seems set to “move the knobs around” as he refers to squad. Despite seven goals in its first two matches, the Warriors routinely failed to maximise their time in the final third against Guatemala. It leaves King in a paradoxical situation where he needs his team to improve defensively and offensively at the same time. “Our problem so far has been goal scoring,” said King. “We have been working on that and watching our games over and over… Panama is one of the best teams in the tournament and we know we have to pick our opportunities. 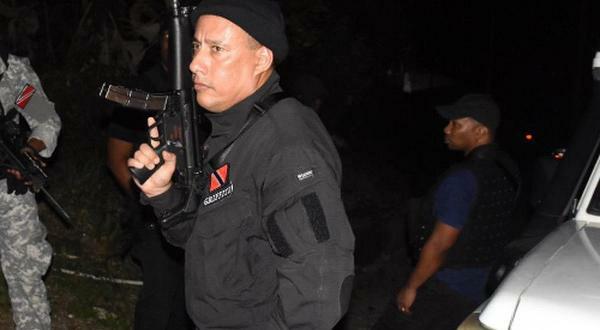 Almost certainly, the Warriors will go no further without a result against Panama tomorrow. King said his squad is ready. From 4 pm tomorrow, it will be time for team captain Shannon Gomez and his troops to walk the talk. 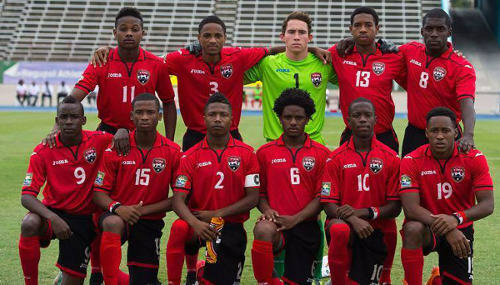 Photo: The Trinidad and Tobago national under-20 team poses before kick off against Aruba in the 2015 CONCACAF Under-20 Championship. Forwards: Kadeem Corbin (St Ann’s Rangers), Ricardo John (Virginia Tech). Derek King (head coach), Hutson Charles (assistant coach), Michael Maurice (goalkeeper coach), Stephen Hart (technical advisor), Douglas Archer (manager), Wayne Cunningham(assistant manager), Michael Taylor (physio), Saron Joseph (trainer), Michael Williams (equipment manager). 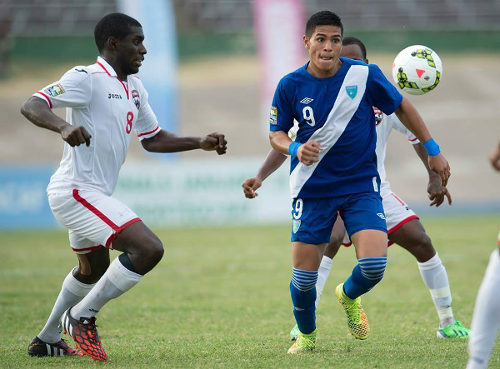 Photo: Panama attacker Ismael Diaz (centre) in action against Aruba during the CONCACAF Under-20 Championship. 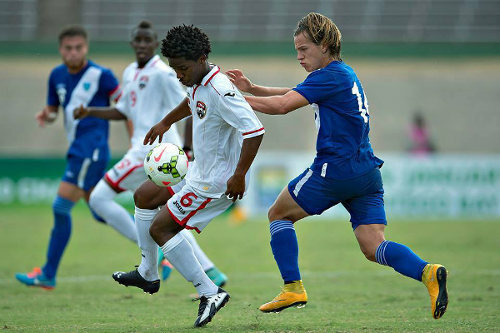 Photo: Trinidad and Tobago midfielder Neveal Hackshaw (left) tries to close down Guatemala star Mauro Portillo during the 2015 CONCACAF Under-20 Championships in Jamaica. 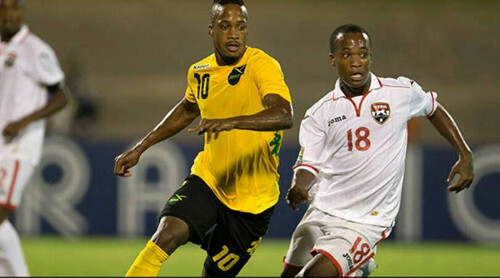 Photo: Trinidad and Tobago midfielder Kevon Goddard (right) tries to keep an eye on Jamaica playmaker Junior Flemmings during CONCACAF Under-20 Championship action in Kingston. John has a lot to prove imho. Would have also liked to see Jabari Mitchell and Woo Ling start as well. Go T&T!! Dion Sosa and Roneil K Walcott, Levi starts! Trinidad and Tobago: 1.Johan Welch (GK); 2.Shannon Gomez (captain), 3.Martieon Watson, 5.Leland Archer, 4.Jesus Perez; 8.Neveal Hackshaw, 17.Akeem Humphrey; 11.Levi Garcia, 9.Kadeem Corbin, 7.Akeem Garcia; 16.Ricardo John. D coach is responsible for win/loss..n we must hold him accountable…should be removed if he fails..n that is consequence management. Trinidad have a history of appointing failures 2 lead..n that is we problem ..
Let’s not go nuts though! Lol. Man, you can see how tough decision making is as a coach eh? I haven’t seen much of Ricardo John before but I hope he can add something today. And maybe Woo Ling or Jabari Mitchell can offer something. It is a real pity that Duane Muckette is not a 100 percent fit. That boy has a bright future. For me, our most outstanding players so far have been Shannon Gomez and Neveal Hackshaw. And Akeem Garcia, Martieon Watson and Aikim Andrews have come close. Most of the others looked really good in spurts but are still not playing at their best to me. Maybe. I’ve never seen Creed play there so I really don’t know. Shannon is very effective there though. So I’m nervous about moving one of my best performing players. And I’ve never seen him in midfield. Generally speaking, I think at international level it is a risk to give a guy a new position against such stiff competition. Unless you are a Trinidad and Tobago coach of course. When you are not paid. There is only one position where we have just one specialist. That is right back. Every other position has two or three alternatives. Aikim Andrews stood in for Shannon in Florida but his skills are better suited to higher up the field. Having said that gambles do work sometimes. So who knows. But then who at right back? When Shannon bombs forward, he is such an intelligent crosser of the ball and he has assisted in two goals already from that position. I wouldn’t want to move him. Perhaps Shannon in a role similar to that of Rooney in the midfield for Man U.
I get your point Dion Sosa. But you always have to balance that loyalty with the other guys who are working their tails off to get in the team too. Mango, I agree. This team was never on an even footing with its opponents. They are trying to beat the odds. and just like our men that didn’t win the Caribbean cup and our women team that didn’t qualify because of the corrupted TTFA madness that continues eh, the under 20 team will not be qualifying either until there is a football revolution in our sweet country and the whole of the corrupted TTFA officials has been removed eh, our football will not be going anywhere and I done talk. Them really good yes. 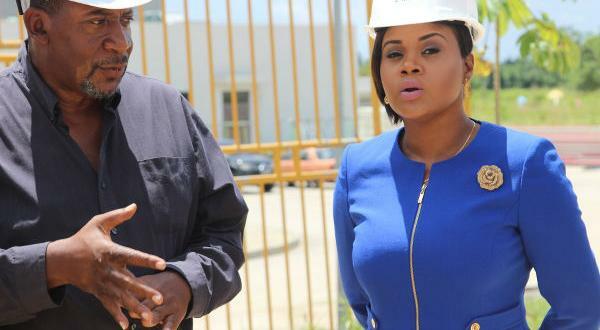 Levi is T&T’s brightest new prospect. No doubt about that. But he is not at the peak of his powers at the moment. Maybe that might change tomorrow. But based on his showings so far, I don’t think it is a guarantee that he will play. Levi has been off form Roneil. I don’t if he will start in any position at all. Levi might be our best player but he isn’t doing very well and both Akeem Garcia and Aikim Andrews have played well. So what do you do? It would be a gamble to start Levi at this stage. How about Levi at the 10? I agree Lasana a lot more creativity and unpredictability. Maybe Matthew Woo Ling might get a shot at unlocking the opposing defence now too. He looks to be in form and we can do with a little bit of extra guile in the centre of the field. If we play at our best, we have a chance. But it will call for an almost flawless performance from players and coach. We probably will not be able to play one way throughout the match. So it is knowing when and how to go for it and when and how to shut up shop. You think we can pull it off? He deserves a chance he is very clinical and works very hard. Let’s go young Soca Warriors all the way to New Zealand.